Barcelona is a beautiful city any time of the year, but at Christmas it really sparkles with markets and festive events. You won’t experience a white Christmas in Barcelona, as it very rarely snows in the Catalan capital. However, the city does go all out to celebrate this time of year, with Christmas markets and enjoyable events. One of the more unusual Catalan traditions is the Caganar, a statuette of a person relieving his bowels. These are often found in nativity scenes in Barcelona and are on sale at the various Christmas markets. While it might sound a little disgusting, the Caganar practice dates back to the pagan ritual of fertilising the soil and these days the funny characters are considered to be good luck. 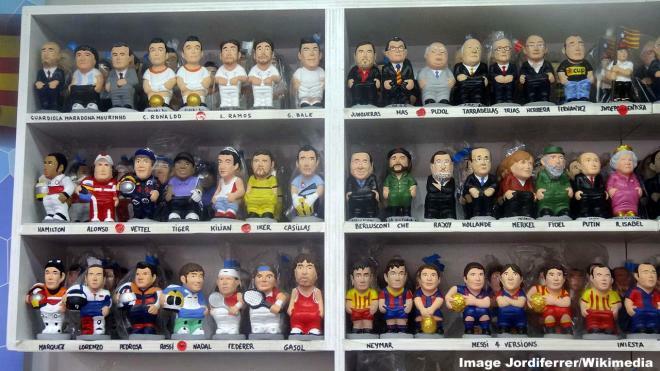 Many celebrities and politicians have been honoured each Christmas with their own Caganars, including Lionel Messi, Bart Simpson, Barack Obama and Donald Trump. Another different event is Catalonia and Spain's "Three Kings" parade, which is enjoyed at the end of the Christmas festivities. This is the city’s main Christmas market and has been running for more than 225 years. The fair is located below Barcelona’s Gothic Cathedral. Most of the stalls sell festive decorations and nativity scene figures, but there is also a selection of handmade craft items and seasonal tree and plants on sale, including the iconic poinsettia. 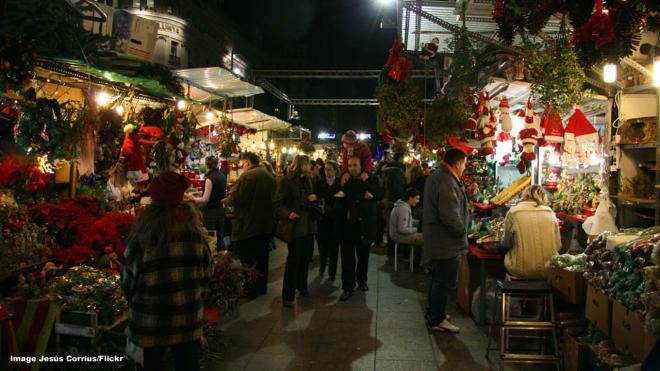 The Santa Llúcia market starts at the end of November and closes on 23 December. This beautiful, traditional Christmas fair is held in front of Gaudi’s masterpiece, the Sagrada Familia church. Here you will find around 120 stalls selling festive decorations and the famous Caganars, as mentioned above and pictured here. Children are often treated to the sight of Santa Claus, who visits the market to collect their letters and hand them balloons and sweets. The market runs up to 24 December and is open every day.